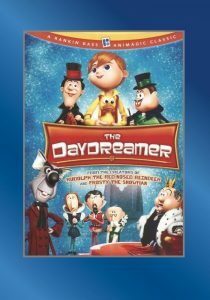 In The Daydreamer, experience one of Rankin-Bass’ best-loved theatrical movies, filmed in an enchanting combination of live-action and stop-motion animation, as young Hans Christian Andersen daydreams his way to adventure through his most famous fairy tales. In ‘The Little Mermaid’ everyone’s favorite girl of the sea (Hayley Mills) must triumph over the evil Sea Witch (Tallulah Bankhead) with a little help from Father Neptune (Burl Ives). In ‘The Emperor’s New Clothes’ a pair of villainous tailors (Victor Borge and Terry-Thomas) create a surprising new outfit for a gullible king (Ed Wynn). The fun continues with Patty Duke as Thumbelina, Ray Bolger as The Pieman, Boris Karloff as a sinister rat, Margaret Hamilton as the mean Mrs. Klopplebobbler, and much more in this timeless kids’ classic.